The Engage with Grace Project is an effort to raise awareness of the importance of end of life care planning and discussing your wishes with your family and friends. Dr. Bryan Vartabedian captures the simplicity of the project in his post, "It began with a simple idea: Create a tool to get people talking. 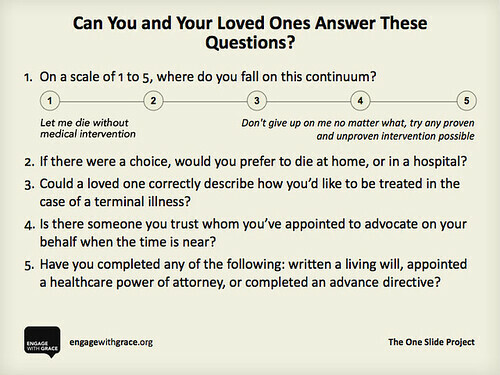 Their tool is a slide with five questions designed to initiate dialog about our end-of-life preferences." Take time during the Thanksgiving weekend to "occupy the dinner table" with your family and friends. Discuss the 5 questions below and share your thoughts and feelings. This is my 4th year participating in the Engage With Grace Project. What prompted me to start participating? It was having the opportunity to watch Alexander Drane tell Za's story at the 2008 Health 2.0 Conference. Her story personally connected as I shared in my 2008 blog post. West Virginia is often negatively portrayed nationally at the bottom or top in national health rankings. However, it is great to see West Virginia leading the way on end of life care planning. 49% of West Virginians have filled out at least one advance directive -- the highest among all states reporting these statistics. However, this statistic shows how few of us actually take the time and effort to document our wishes. More than 1/2 of the population have left these difficult decisions to be made by their family and health care providers. This statistic shows the importance of the Engage With Grace message. For West Virginia readers who want to learn more about end of life care check out the resources provided by the West Virginia Center for End of Life Care. There is valuable information for health care professionals to "Why and how to have end-of-life discussions with your patients", "Accessing Decision Making Capacity", and POST (Physicians Order for Scope of Treatment) Forms. The website also provides FAQs, educational videos, and forms, including the standard West Virginia Advanced Directive Forms. West Virginia is also creating the e-Directive Registry in conjunction with the West Virginia Health Information Network (WVHIN), West Virginia's health information exchange (HIE). The e-registry will store advance directive forms, Physicians Orders for Scope of Treatment forms, and do not resuscitate cards. The registry will allow treating health care providers to access the stored information 24/7 from around the state through the WVHIN. Most importantly, the registry will be accessible by you and I as health care consumers to verify the accuracy of our wishes. 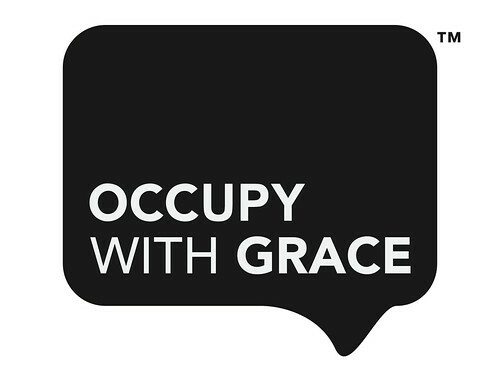 Following is the 2011 blog post by the Engage With Grace Team -- Occupy With Grace. Help spread the word this Thanksgiving weekend by telling your end of life care story and posting the message below. You can get the HTML to post here. Once again, this Thanksgiving we are grateful to all the people who keep this mission alive day after day: to ensure that each and every one of us understands, communicates, and has honored their end of life wishes. Seems almost more fitting than usual this year, the year of making change happen. 2011 gave us the Arab Spring, people on the ground using social media to organize a real political revolution. And now, love it or hate it - it's the Occupy Wall Street movement that's got people talking. Smart people (like our good friend Susannah Fox) have made the point that unlike those political and economic movements, our mission isn't an issue we need to raise our fists about - it's an issue we have the luxury of being able to hold hands about. It's a mission that's driven by all the personal stories we've heard of people who've seen their loved ones suffer unnecessarily at the end of their lives. It's driven by that ripping-off-the-band-aid feeling of relief you get when you've finally broached the subject of end of life wishes with your family, free from the burden of just not knowing what they'd want for themselves, and knowing you could advocate for these wishes if your loved one weren't able to speak up for themselves. And it's driven by knowing that this is a conversation that needs to happen early, and often. One of the greatest gifts you can give the ones you love is making sure you're all on the same page. In the words of the amazing Atul Gawande, you only die once! Die the way you want. Make sure your loved ones get that same gift. And there is a way to engage in this topic with grace! Here are the five questions, read them, consider them, answer them (you can securely save your answers at the Engage with Grace site), share your answers with your loved ones. It doesn't matter what your answers are, it just matters that you know them for yourself, and for your loved ones. And they for you. We all know the power of a group that decides to assemble. In fact, we recently spent an amazing couple days with the members of the Coalition to Transform Advanced Care, or C-TAC, working together to channel so much of the extraordinary work that organizations are already doing to improve the quality of care for our country's sickest and most vulnerable. For too many physicians, that conversation is hard to have, and families, too, are reluctant to initiate a discussion about what Mom or Dad might want until they're in a crisis, which isn't the best time to make these kinds of decisions. Ideally, that conversation should begin at the kitchen table with family members, rather than in a doctor's office. It's a conversation you need to have wherever and whenever you can, and the more people you can rope into it, the better! Make this conversation a part of your Thanksgiving weekend, there will be a right moment, you just might not realize how right it was until you begin the conversation. This is a time to be inspired, informed - to tackle our challenges in real, substantive, and scalable ways. Participating in this blog rally is just one small, yet huge, way that we can each keep that fire burning in our bellies, long after the turkey dinner is gone. Wishing you and yours a happy and healthy holiday season. Let's Engage with Grace together. To learn more please go to www.engagewithgrace.org.This post was developed by Alexandra Drane and the Engage With Grace team. Today the Office for Civil Right (OCR) announced details of a pilot program to perform up to 150 audits of covered entities to assess privacy and security compliance under HIPAA. OCR will be conducting the audits between November 2011 and December 2012. The days of waiting for HIPAA privacy and security enforcement activities are over. The announcement of these planned audits will get the attention of health care providers who have failed to focus on HIPAA privacy and security compliance efforts. The announcement will remind all health care providers to maintain an active, current HIPAA privacy and security compliance program. The audit program serves as a new part of OCR’s health information privacy and security compliance program. OCR will use the audit program to assess HIPAA compliance efforts by a range of covered entities, Audits present a new opportunity to examine mechanisms for compliance, identify best practices and discover risks and vulnerabilities that may not have come to light through OCR’s ongoing complaint investigations and compliance reviews. OCR will broadly share best practices gleaned through the audit process and guidance targeted to observed compliance challenges via this web site and other outreach portals. The OCR HIPAA Audit Program page also provides detail on when the audits will begin, who will be audited, how the audit process will work, and what will happen after the audit. The information indicates that they will select a broad range of covered entities for the first round of audits and that business associates will be included in future audits. OCR provides the graphic below to help describe how the audits will be performed. Covered entities will be selected, notified, and asked to provide documentation of privacy and security compliance efforts within 10 business days. An onsite visit will occur and interviews will be performed. A draft report will be provided to the covered entity and there will be a procedure for the covered entity to discuss the areas of concern raised in the audit and describe any corrective action they may implement. The HIPAA audits are a requirement under the American Recovery and Reinvestment Act of 2009 (Section 13411). HHS awarded to KPMG a $9 million dollar contract earlier this year to assist OCR with the audits.